So, I finally got around to watching Melancholia, Lars Von Trier’s disaster movie. It only took me three days of fever-induced nausea to find the time to do so. Fair warning, I am sick as a dog, so not all of this might make much sense. I thought I’d take a different route here and compare Melancholia to the absolute best disaster movie of all time, Armageddon, which, when you boil it down, is the same exact movie. Sort of. I’ll break it down in ten categories for you. 1. Plot: Armageddon came out in 1998 (so you’ve had 15 years to see it, don’t complain about the plot being spoiled) and is a Michael Bay movie starring Bruce Willis (If you possibly think that a movie with Bruce Willis made by Michael Bay is going to have a plot, you probably thought the Passion of the Christ had a surprise ending). Anyway, a giant meteor is going to hit Earth. Bruce Willis says “oh hell no” and goes to blow it up. Melancholia has a similar plot, a giant hidden planet is going to hit Earth, and it does. Before you cry spoiler, we are shown the collision in the opening scene. Oops, there goes the suspense. Also, while the planet is heading our way, two sisters have a mental breakdown, with enough talking and emoting to make the French New Wave catalog look like a list of 1980’s action films. Winner: Armageddon. 2. Camera work: Michael Bay averages 1.5 seconds between cuts. Von Trier averages 3.7 hours between cuts, and insists on mostly handheld camera work, zooming in and out, because it’s more authentic or artsy or something to make us feel like we’re there with the actors instead of some artifical omniscent observer. Michael Bay will give you ADD. Von Trier will give you narcolepsy. Winner: Melancholia, because at least Von Trier doesn’t rely on post and editing to put together a film. 3. Director: Lars Von Trier is probably our generation’s Ingmar Bergman, except that his films are so gloomy they would make Bergman run out of the theater and shoot himself in the face. Europa is my favorite film of his, and he did give us the brilliantly disturbing yet incomprehensible Antichrist. He is one of the most unique directors working today, giving Paul Thomas Anderson a run for his money. Michael Bay is probably our generation’s most profitable director, despite possibly actually being the Antichrist. His craftmanship puts him in the running with Paul W S Anderson in terms of working directors. Winner: Melancholia. 4. Running Time and pacing: Armageddon, 2 hours 33 minutes, feels like 90 minutes. Melancholia, 2 hours 15 minutes, feels like roughly two weeks. Winner: Armageddon. 5. Paternal Suicide: Bruce Willis kills himself with a nuclear bomb to save humanity. Like a boss. Kiefer Sutherland kills himself with sleeping pills in a horse stable. Most un-boss-like. Really? Kiefer’s Jack Bauer would have built a space rocket out of golf clubs, duct tape, and propane tanks, flown to the alien planet, and yelled “Dammit” at it 437 times, which would have caused it to melt into Kool Whip, that delightful, low-calorie, and most importantly, non-world threatening topping treat. Winner: Armageddon. 6. Images of destruction: Armageddon’s NYC impact imagery is a little too close to reality. On the plus side, the Eiffel Tower is destroyed, leaving the French no place to fly the asteroid’s flag after they surrender to it without a fight. The asteroid looks like Satan’s Kidney Stone. Melancholia gives us a space-eye view and a ground-eye view of the impact, bookends at the beginning and end of the film. Animals just keel over or burst into flames, and weird magnetic lightening pops up from hair and fingers. The menacing planet looks like a shiny pretty marble. Winner: Tie. 7. Orchestral Score: Armageddon has Trevor Rabin, formerly of the band “Yes.” Melancholia has Wagner, of the band “Richard Wagner is Better Than A Guy Who Quit The Band Yes.” Winner: Melancholia. 8. Female Lead: Liv Tyler can act, you learn Elvish and see how well you do with it. But here, she’s just around for Ben Affleck to play with his animal crackers on her stomach. Kirsten Dunst puts in her best work ever, but, that only really means she acts better than she did in Interview with a Vampire or the Spider-Man trilogy. Congratulations? Winner: Melancholia. 9. Golf in Film: Bruce Willis fires off golf balls at hippie oil protesters from his drilling rig. Kiefer Sutherland owns a golf course, and tells us and the other characters this fact about 76 times through the course of the movie. Most of the film takes place at this golf course, which should be an obvious clue when figuring out how exciting this whole adventure is going to be. Also, apparently, the “19th hole” has some kind of “ooh I’m smart and noticed that there are is a 19th hole but there shouldn’t be because golf courses only have 18 holes, where’s my film snob prize” meaning. Winner: Armageddon. 10. Viewer abuse: Armageddon has more astrophysics flaws than Star Wars. Sure, NASA let Bay film a bunch of shuttle footage and let the actors wear real spacesuits, but in terms of insulting the viewer’s intelligence, man, this basically puts diapers on the viewer and lets us chew on the banisters. 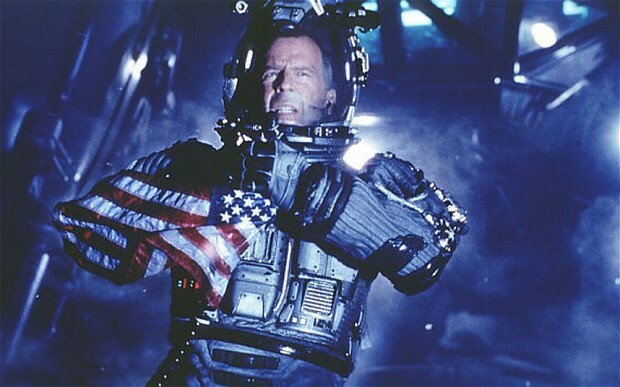 Armageddon is to scientific theory as what Gladiator is to historical accuracy. It’s that bad. Melancholia goes the opposite route, you either have to have a friend with a doctorate in religious theory to explain the movie to you or you need to watch the movie 794 times to “get it.” Winner: Tie. So there you have it, my friends, I had to let the ramble out. It’s a tie, they’re the same movie. Out of 10 categories, it’s 4-4, with 2 categories a tie and therefore discarded. My main point is this: Between these two films, here’s the problem with movies today: we either get something studio-driven and dumbed down to the lowest common denominator, but is a fun movie, or we get something truly different and artistic, but we don’t know what the hell to do with it once we see it. And we throw our money towards the stupidity. Every time. Don’t get me wrong, I love Armageddon, but really it’s a very shiny pile of crap once you break it down. I didn’t enjoy watching Melancholia all that much, but it stuck with me and forced me to think about it. I’m not saying go watch every independent art movie and turn into a snobbish hipster about it, but I am saying that we need to be careful about throwing our money at every summer blockbuster just because the previews show a bunch of stuff exploding. Thanks for reading. Go watch a movie that no one you know has seen yet. End of rant. Lars von Trier’s film, Melancholia, raises what Tillich calls “the religious question” and can be read through the lens of radical theology. This approach offers both an interpretation of the film and an entrée into radical theology. Melancholia tells the story of two sisters, Justine and Claire. In the first part of the film, Justine has just been married and arrives at her wedding reception, held at Claire’s mansion. What follows is a nightmare scenario. Justine suffers from chronic depression, and try as she might, she cannot enjoy the party. She is beset my demands to enjoy herself by her family, her employer, and the wedding planner. Each has different expectations of Justine. Her father is a hedonist, and encourages her to enjoy the extravagance of the party. Her mother is opposed to marriage, and encourages Justine to seek happiness by abandoning her new marriage. Justine’s wealthy brother-in-law, John, tells Justine that since he has spent “a great deal of money” on the wedding, he expects her to look happy in return. Her employer offers her a toast, but turns the moment into an opportunity to promote her to a new position at his ad agency, and demands that she give him a tagline for a new campaign that very evening. The wedding planner grows impatient as Justine’s withdrawal from the party due to her depression ruins his carefully laid plans. Justine’s husband tries to console her with a photo of an orchard he has secretly bought for her, in the hopes that some day she can go there and be free of her depression. He gives her the photo to keep with her as a memento. After sexual foreplay, Justine abruptly leaves the room, leaving husband and photo behind as she distractedly wanders the opulent grounds of the estate. Over the course of the evening, as Justine fails to meet the expectations of her family, employer, and social norms, and fails to enjoy the wealth, beauty, and sexual pleasure available to her, each guest turns against her in anger and frustration. As dawn breaks, Justine’s family has berated her, her new husband has abandoned her, and her boss has fired her. All bonds, familial, economic, and social, have been broken in the course of the evening. The second part of the film takes place some time after the wedding. Justine has slipped into an almost catatonic depression. Strangely, in the time since the wedding, a massive rogue planet, named Melancholia, has emerged from behind the sun, on a path toward Earth. Astronomers predict that it will pass by the Earth, providing an amazing astronomical spectacle, but leaving the Earth untouched. Justine’s brother-in-law John is an amateur astronomer, and follows news of the new planet enthusiastically. Justine’s sister Claire is afraid that the planet will collide with the Earth. Despite John’s insistence that astronomers have calculated its path and determined Earth’s safety, Claire obsesses about the planet, and visits websites that claim that the planet’s true course is being covered-up by authorities. John spends his days with his son, Leo, excitedly anticipating the arrival of Melancholia. Claire spends her time caring for Justine, who she is able to gradually bring to good health. Leo is excited for his aunt’s return to health, as he wants to build “magic caves” with her, a request he makes repeatedly, thought Justine is as yet too ill to do this with him. Gradually, Justine becomes more functional as Claire attends to her with patient care. Justine is able to care for herself, but remains depressed and uninterested in regaining all that she lost on her wedding day. It soon becomes apparent that Melancholia will pass by Earth only to arc back again on a collision course. Justine welcomes the destruction of the Earth, calling the world “evil”. Claire is incredulous that Justine could say such a thing. John initially denies the prediction of disaster, but once his own calculations confirm it, he commits suicide. Claire is terrified of her and Leo’s impending doom, and tries to flee with him to the local village. After returning from this vain attempt at escape, Claire she tells Justine that she wants to spend their last moments together out on the terrace, with music and wine. Justine rejects this idea entirely, upsetting Claire. Justine goes outside to Leo, and tells him they are going to build a magic cave. 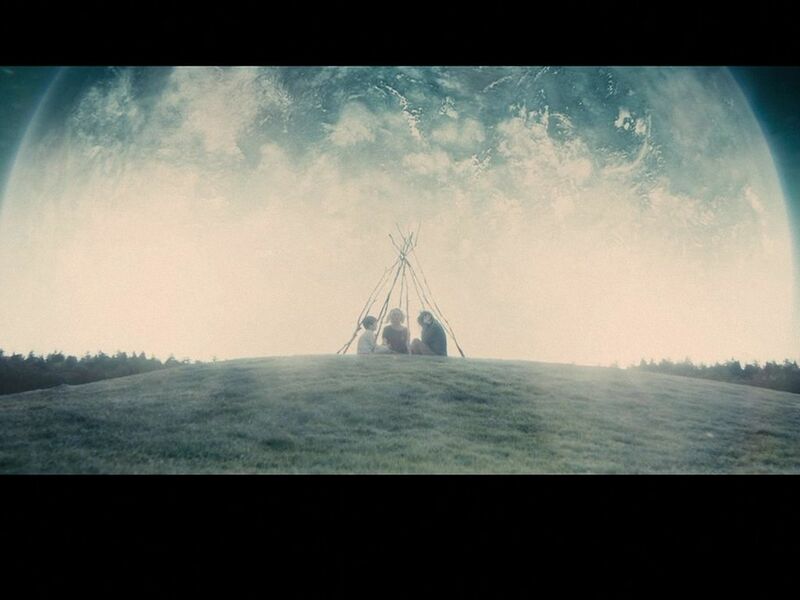 As Melancholia looms larger in the sky, the trio gather branches and make a tipi outside. They gather together inside, as Melancholia collides with and obliterates the Earth. In Melancholia, this stripping away of all systems of meaning happens to Justine at her wedding. Yet all of these were oppressive to her – they all made demands of her that she could not meet, and made promises of meaning upon which they did not deliver. Any investment she would have had in them would have been idolatrous. In Tillichian terms, if she had made any of these her ultimate concern, they would have failed to fulfill her. In this way, the stripping of these sources of meaning strips away the power these narratives have over her. So far, this is a properly Tillichian approach, but Rollins takes us further than Tillich. Where Tillich suggests that these idols fail because they do not ultimately fulfill, Rollins argues that anything that promises ultimate fulfillment is an idol. In this way, any image of God that offers fulfillment is an idol. Christ on the cross loses God. Bonhoeffer calls us to live without God. What is lost is the deus ex machina that guarantees meaning. Although Justine is liberated from the systems that oppressed her, her experience of liberation is devastating and traumatic, and suggestive of what is to come in the full Apocalypse of God. It is once one has been liberated from these systems that the Apocalypse of God can occur, that one can be for-others, because one is no longer committed to this world, one is not defined by it, and so one can be for-others without prohibitions that arise from our systems of meaning. But how can one be for others if one rejects the world? Justine demonstrates with No-saying when she calls the world evil. Whereas John denies that Melancholia will destroy the world, and Claire is terrified that it might, Justine never indicates what her expectation is, though she welcomes an apocalypse, because the world, as it exists, is a source of oppression. For John and Claire, the threat posed by Melancholia is their ultimate concern. John responds to this threat by despair and suicide, and Claire responds by despair and religious ritual: she tries to flee what cannot be escaped, and then proposes “wine and music” at the mansion(Sunday morning, anyone?). The existence of the threat is of ultimate concern for the couple. For Justine, however, the ultimate concern is the evil of the world. If Melancholia will destroy the evil world, she welcomes it. Her eschatological faith is one that is independent of the actual threat of Melancholia. If the rogue planet had simply passed by Earth, she would still remain committed to the destruction of the world. Justine has experienced crucifixion. A personal apocalypse engenders in her an eschatological faith that prepares her for the Apocalypse of God: the coming of Melancholia to destroy the world. Because Justine’s faith is not a world-affirming faith, she can become other-affirming. The radical No produces a radical Yes. She says No to Claire’s religious responses to Melancholia, to anything that offers assurance (and not just false assurance). Justine’s radical Yes comes when she goes to Leo and tells him it is time to build a magic cave. Justine invokes magic and uses sticks to build an obviously-feeble shelter. There is absolutely no pretense here. The invocation of magic and the frail and failing shelter point directly to the coming Apocalypse, rather than directing Leo and Claire to thoughts of escape or survival. In this place of weakness, Justine comes together with those she loves, free to love them as they are as Melancholia/God comes to obliterate the world. This is radical liturgy: an act of love that exposes and affirms our brokenness rather than trying to cover over it. In this space, Claire is able to weep, and to be with those she loves. Justine remains calm, and Leo, the child, waits almost expectantly. Radical liturgy does not draw us into despair, but acknowledges the place where we already are, and allows us to acknowledge it and share that place with others in love. What happens after the world ends? What does the post-apocalypse look like? It is not a place where all is made right according to the systems of meaning of the old creation. It is a place that begins to emerge in the magic cave, in a place of weakness, united in love and frailty, open to the world-destroying, incoming Apocalypse of God. 1 Walter Kaufmann, trans., The Gay Science (New York: Vintage Books, 1974), 182. 4 John de Gruchy, ed., Dietrich Bonhoeffer: Witness to Jesus Christ (London: Collins, 1987), 273-75. 6 John de Gruchy, ed., Dietrich Bonhoeffer: Witness to Jesus Christ (London: Collins, 1987), 273-75. 7 Thomas J.J. Altizer and William Hamilton, Radical Theology and The Death of God (Indianapolis: Bobbs Merrill, 1966) 98-103. 11 John de Gruchy, ed., Dietrich Bonhoeffer: Witness to Jesus Christ (London: Collins, 1987), 291.